In his latest exploration of electronic music theory, Dubspot contributor Michael Emenau a.k.a. MNO investigates the concept of musical Modes. Learn more about music theory and the music you love from the inside out in our upcoming Music Foundations course in NY, LA, and Online. Check out the course details and enroll today! Anyone who has studied or Goggled around about music theory or musical scales will eventually come upon the term “Modes” or “Musical Modes.” If you poke a bit deeper, you will see that 95% of what people say about Modes can be broken down into the following three questions. How to describe the Mode flavor? This is all useful information, but I have always felt it left me hanging and wanting to know how to use the different Modes creatively. In this article, we will briefly discuss the musical theory behind Modes as well as look at some melodic and harmonic examples of how you can effectively incorporate Modes into your projects. A Mode is a type of scale. For example, Modes are alternative tonalities (scales) that can be derived from the familiar major scale by starting on a different scale tone. Music that uses the traditional major scale can be said to be in the Ionian Mode. 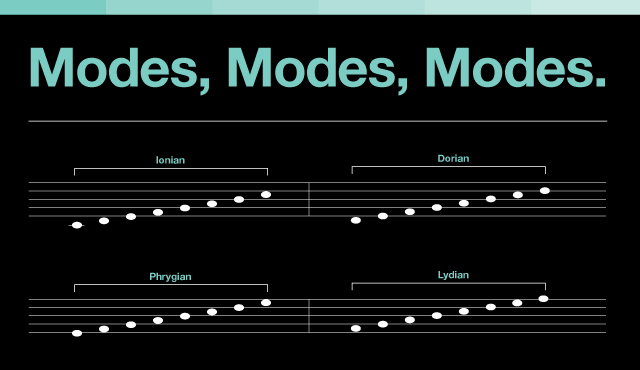 There are seven Modes: Ionian, Dorian, Phrygian, Lydian, Mixolydian, Aeolian, and Locrian. Let’s look at a couple different ways to construct the different Mode types. The C major scale has the notes C-D-E-F-G-A-B-C. If you use the same notes but start on the second note, which is a ‘D’ note (D-E-F-G-A-B-C-D), you will be in Dorian Mode. Using this same logic, you can derive all the Modes. For example, starting with the 3rd note of the scale = Phrygian, 4th note = Lydian, 5th note = Mixolydian, 6th = Aeolian, and 7th = Locrian. 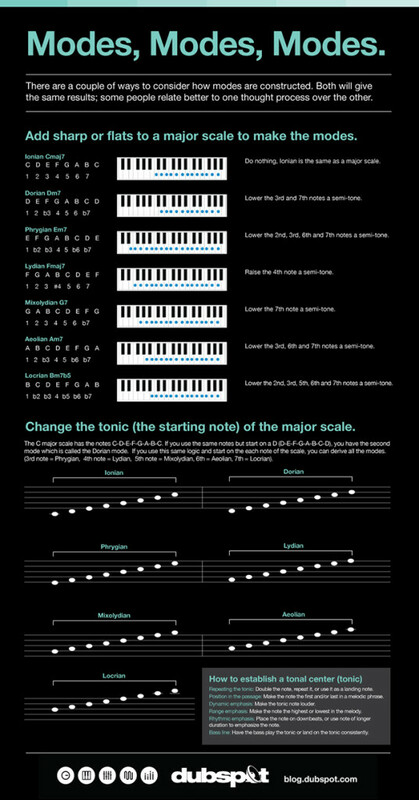 We can see that all the same notes in the C major scale are being used, the only difference is the tonic notes used to start the scale. Changing the Mode allows us to emphasize different notes of the scale. There are many mnemonics for remembering how to construct the different Modes, but it is often easier to find the notes of a certain Mode in a specific key by looking it up on the Internet. There are certain ways we use scales to help define our melodies. The difference between C Ionian and E Phrygian is not the notes being used, but which notes are being emphasized. For example, looking at the C major scale again, Phrygian Mode would emphasize the ‘E’ note, which has a different feeling than emphasizing the ‘C’ note in Ionian Mode. It’s important to establish the tonal center for the mode you use in your music. Below are a few examples of how to establish a tonal center for a melody. Repeating the tonic: Doubling the note, repeating it, or using it as a landing note. Position in the passage: Placing the note first and/or last note in a melodic phrase. Dynamic emphasis: Increasing the tonic notes velocity. Range emphasis: Making the note the highest or lowest in the melody. Rhythmic emphasis: Placing the note on downbeats, or sustaining the note for a longer duration. Bassline: Have the bass play the tonic or land on the tonic consistently. Please note that these techniques are not assured to work 100%. These methods are good starting points to help grasp the overall concept of establishing the tonal center for a melody. Once the tonic is established, the remaining notes in the melody will resolve in “natural” ways. By having a defined tonic or tonal center, your melody will feel to be part of the Mode in which you had intended. One of the main reasons why we choose to use a certain Mode is because of the emotional content that each Mode presents. Choosing a Mode is like choosing an emotion. Excuse me for being a bit ethereal in this description but one way to describe the differences between the Modes is how bright or dark they are. This example is entirely subjective, but I find the more sharps and fewer flats used in a mode, the more uplifting and happy the vibe feels. Concurrently, using more flats, the darker and more sinister the sound becomes. I feel this way because certain sounds, chords, and Modes are associated with certain emotions. For example, Lydian and Ionian Modes are used in happy and spiritually uplifting music. Mixolydian and Dorian Modes are often used in blues and gospel music. The Aeolian (minor) Mode is defined as melancholy and sad while Phrygian and Locrian Modes are the go-to Modes for scary, dramatic, and otherworldly sounds. Below is a bright to darkness Mode chart. Notice the more flats, the darker the sound. OK, Let’s Add a Little Guitar to That! Modes get really interesting when you associate different chord structures. Let’s explore this further with a C major scale. When playing major keys, there is a classic set of chord progressions based on the 1st, 4th, and 5th notes of the scale. In C major, these chord changes consist of Cmaj, Fmaj, and Gmaj. This sound is so ingrained in our ears that we just consider it to be “right,” and there are 1,000’s of songs based upon these three chord progression. What’s interesting is that each mode has a set(s) of additional chord changes that work quite well at establishing the tonal center as well as inspirational for creating new melodies. Try experimenting with the following chord progressions when writing in different Modes. Using the seven Modes is a great way to open up your pallet to different ideals in composition. In the end, it doesn’t matter what you have written down on paper or programmed in your sequencer. If it sounds good, and it gets across the musical idea that you are trying to express, then it is right! Expand your music theory knowledge further by checking out more educational articles by Michael Emenau a.k.a. MNO here.